The Ford Transit Custom is a state-of-the-art mid range van and is now the product that every other contender in this segment fears. With a much-improved cabin and car-like driving manners, it's a great ownership proposition. Class-leading carrying capacity and solid financials make it work on the balance sheet too. Let's check out the practical 130PS lwb version. Ford Transits lead a tough life. Always have, always will. It's the nature of the market. They need to cover a huge array of tasks, from rental fleet vehicles to crew buses, ice cream vans to site workhorses and airport taxis. In short, the Transit needs to be able to do almost anything. 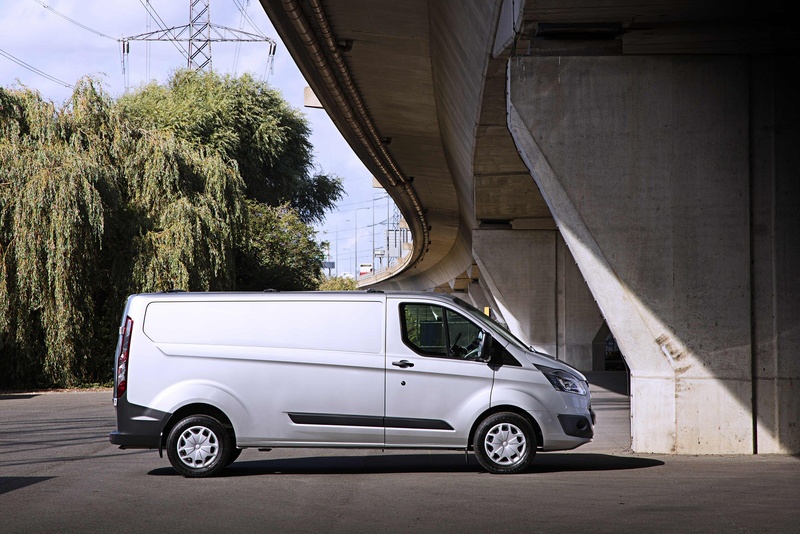 A few years ago, Ford realised that trying to do all that from one platform was just too big an ask and now the Transit is a family of models, that encompasses everything from a lightweight Transit Connect city van right up to a hefty tipper truck. The bedrock of the Transit range, and still the definitive model today, is what's now called the Transit Custom to differentiate it in the minds of buyers and if you haven't driven a van for a while, you need to try one of these. Perhaps you thought vans were crude and awkward to drive. If so, prepare to have your perspectives rearranged. That's what happened when we tested the top 2.0 EcoBlue 130PS long wheelbase variant. Whether you choose your Transit Custom with long or short wheelbase, as a standard van, Double Cab or Kombi minibus or in whichever payload or trim level, it'll come with a 2.0-litre EcoBlue diesel engine up-front. There's a choice of output though, ranging from an entry-level 105PS unit, through this 130PS mid-ranger and on to the 170PS flagship motor if your hauling needs are heavier. Whichever of these you choose, sales statistics suggest that the bodystyle variant you're most likely to want to match it to is the short wheelbase, low roof model, a version that should feel even more car-like to drive than its larger contemporaries. And Ford's engineers have certainly gone to great lengths to make this Transit feel more car-like at the wheel than ever before. To achieve this, the Ford global one-tonne platform which underpins the Transit Custom was made much stiffer and stronger - increasing torsional stiffness by as much as 37 percent - benefiting both handling and noise levels. Tuning of the suspension components and steering system resulted in significantly improved ride comfort too, along with the required more precise and agile handling. Like the current Ford Focus, the Transit Custom also features the latest Electronic Stability Program technology with Torque Vectoring Control for better traction and stability. The stiff structure, together with a determined effort to eliminate unwanted noise and vibrations throughout the vehicle, has resulted in a quieter environment for the driver. As proof that this has been achieved, Ford claims that speech intelligibility has improved by nine percent within the cab in this generation model. This revised Transit Custom has a smarter look that's based around a high-mounted trapezoidal grille and dynamic, slim headlamps. The cabin has been completely upgraded, with an instrument panel based on Ford's latest interior design philosophy which offers a user-centric layout influenced by consumer interactions with smart devices and tablets. High-series models feature a floating, tablet-inspired eight-inch 'SYNC 3' colour centre-dash touchscreen for communications and entertainment. For models not equipped with the larger display, the MyFord Dock in the centre of the instrument panel provides the ideal location for drivers to mount, store and charge their smartphone, MP3 player or satellite navigation system. Get inside and you'll find well-sculpted front seats and a dashboard that wouldn't look out of place in a family car with a colour display panel on the dashtop, nice use of metallic finishes, wheel-mounted audio controls and a centre console that's clearly had some styling love lavished on it. There's storage for bottles, phones and papers, and driver comfort is improved through a highly adjustable driving position which features increased seat travel. There's 30mm more rear travel for taller drivers and the steering column is adjustable for reach and rake. As usual with Transit models, there's a huge range of choice. The short wheelbase Custom models offer an overall length of 4.97 metres, but if that's not enough, long wheelbase variants like the one we tried extend that to 5.34 metres. All versions currently offer the same roof height. Prices have been kept very reasonable, with well under £20,000 ex VAT being enough to get you the entry level 105PS variant. From this starting point, a £1,500 premium will net you the pokier 130PS engine and a £2,500 premium will get you into the really quite rapid 170PS version. Whatever your eventual choice, you should be able to make your Transit Custom as versatile as your working day demands. Ford claims class-leading load-carrying ability, something aided by a number of clever loadspace features. These include a load-through hatch in the bulkhead for extra-long items and an integrated roof rack which can be folded away when not in use. You've also the chance to benefit from the availability of technologies like a Lane Keeping Aid (to keep dozy drivers from veering out of their lanes on the highway) and Ford's clever 'SYNC' system for your mobile phone. If you�re looking for a new Ford Transit Custom 340 L2 Diesel Fwd 2.0 TDCi 170ps Low Roof Kombi Trend Van for sale, you�ve come to the right place. At Bristol Street Motors we don�t just have the best Ford Transit Custom 340 L2 Diesel Fwd 2.0 TDCi 170ps Low Roof Kombi Trend Van deals, we also offer friendly advice and help with all your enquiries to ensure your buying experience is a happy experience.